Q: Where did you guys get all your videos? A: We collect Green Day VHS video tapes since 1994, and on DVD since about 2003. This collection wasn't built in one day, but very slowy, so be patient if you start yours now. We got most of our stuff by trading with individuals. Back then before the web, we found most of our traders through classifieds in music magazines. Now, best place to look is on Internet newsgroups and by searching the web with Google. Q: Do Welcome to Paradise and J.A.R. have any TV music video? A: Yes, Welcome to Paradise does have an official TV music video. For a long time I thought it didn't, but it does! Bob Sarles, editor of the first two Green Day videos in 1994, writes us: "The first was "Longview" the video that broke the band on MTV. That video was directed by Mark Kohr and produced by Commotion Pictures. The second video, produced not long after that was "Welcome to Paradise". It was produced also by Commotion Pictures and directed by Robert Caruso, and paid for by Warner Bros. 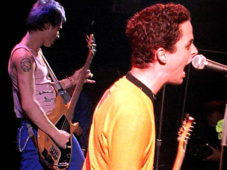 The video was shot in 16mm film at a Green Day performance at Slims nightclub in San Francisco in 1994. We used footage shot during the sound check and the show. The band played live, but the footage was edited to the CD track of the song. For some reason MTV did not put the video into rotation. It may have been shown in Europe, but not in the USA. I was very happy to have edited "Longview," which was a big success." Visit his website at ravinfilms.com. No, J.A.R. does not have a TV music video, but you can see it in the movie Angus, it is the song at the end when the credits are rolling! At some point in the actual movie, Green Day is also shortly mentioned. Q: I want to buy one of your Green Day video tapes or DVDs. What should I do? A: I'm sorry, I am not currently selling CDs, tapes or DVDs. So please don't ask me that. I used to do it in the past, but now I can't anymore. I might occasionally auction off some stuff. If this happens, it will be posted on the main page. Q: Are the CDs you have on your site for sale? A: No, see previous question. Q: I wanna trade bootlegs with you. Here's my list. Interested? A: I might. You can always try, I'll answer you. But I don't guarantee a fast answer, or that we can agree a trade. Q: Can I use your videos on my site? Do NOT link from your site directly to a video file. Please link only to the main page. If you wish to link directly to a video file, then copy that file to your personal server, leave the logo inserted in the clip, and credit greendayvideos.com where you put the video on your site. That is, state clearly and not in tiny characters that the videos come from greendayvideos.com, with a link to the main page. Inform me! Send me an e-mail with the URL of your site. Q: I don't hear the sound in your videos. What's wrong? A: The most probable reason is that you do not have the latest version of QuickTime installed on your computer. The full-length clips require at least QuickTime version 4 or above, and the short clips require QuickTime version 3 or above. So install the latest version of QuickTime, it's free and that should solve your problem.